" Wait you did what?!" Hermione screeched to Ginny when they were walking in Diagon Alley. They needed to shop some school stuff. Harry and Ron was not going back to Hogwarts. They would start some Auror-training a few days after Hogwarts started.
" Yeah we broke up. No big deal" Ginny said calmly. " He&apos;s a great friend, but we don&apos;t really work out." Hermione was quite shocked, she had thought since her second year that Harry and Ginny would be together. Oh well, it is what it is.
" And you didn&apos;t cry or anything? No emotions at all...?" Ginny shrugged and looked inside at Madame Malkins shop. They needed some new robes so they stepped inside. " We just talked and was fine with it"
" I&apos;m glad you guys are fine with it, so don&apos;t get me wrong Gin. I just didn&apos;t see it coming"
" That&apos;s okay" Ginny smiled. 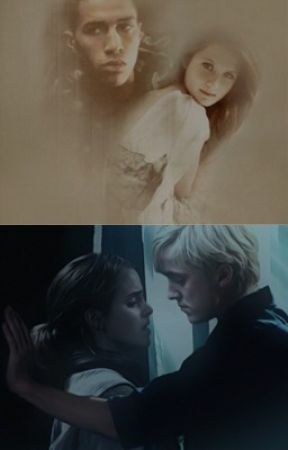 But her smile faded away when she looked over Hermione&apos;s shoulder. Her face got pale and her eyes looked almost petrified.
" Gin, what&apos;s the matter?" Hermione said worriedly. Ginny nodded towards the background of Hermione and she turned around slowly. There she saw them. The two Slytherin guys. Draco Malfoy and Blaise Zabini.
" Are they going back to Hogwarts?!" Hermione hissed and looked at Ginny who just thought the same thing.
" I-I don&apos;t know. It&apos;s not impossible, is it?" Ginny said. She kept her eyes on the dark skinned Wizard and prayed to God he wouldn&apos;t look back at her. But this wasn&apos;t her day anymore.
" Zup Weaselette?" Blaise said when he saw her staring at him. Hermione looked away and started to slowly walk away. She looked at some new robes with her house colors.
" Granger" She jumped at the voice behind her and turned around. His grey eyes met hers brown ones.
" Malfoy" She hissed and looked annoyed.
" How are you doing?" He said nicely and walked closer to her. But she backed away two steps. " I was fine until you got here. What do you want?" Draco immediately looked hurt by her words. But of curse, what hadn&apos;t he done in those early school years? Calling her Mudblood as soon as he got the chance.
" I just wanted to wish you a happy school year, that&apos;s all" With that he left her and she saw him walk out from the shop. She suddenly felt a bit guilty. She didn&apos;t mean to sound so rude, but she was actually wondering what he wanted from her.
" You got nerve to talk to me, don&apos;t you? I thought you despise people like me?" Ginny snorted at Blaise. Suddenly he walked closer to her, but Ginny didn&apos;t move. Oh no, she wouldn&apos;t let a spoiled pureblood Slytherin like him make her back away when he got closer. She wanted to be near him if she wanted to punch him.
" I just wanted to talk with you. But I suppose you&apos;re still with that Pottey Potter so he would be here in any minute to beat me up, right?" She wanted to tell him they broke up, but it wasn&apos;t really his buisness was it? No it wasn&apos;t, so she didn&apos;t say anything. She just let her silence tortur him.
" See you at school"
The last thing he did when he walked outside to Draco was winking at her. And not even Ginny Weasley could stop blushing.